In my Transformation communication role, I have coordinated the production of thousands of signs over the past six years, but this Emergency Department sign is the first one that has elicited a strong emotional response from me. Not only does this sign represent the closing of the Wood Street ED, but also the end of the most exciting and rewarding project of my professional career. As much as I joked – and at times groused – about all of the signs I made, I will miss them now that the Tower is opening. It’s hard to believe I will no longer be called upon to help with directional signs, fencing banners and educational boards explaining what is going on behind construction structures. But on the bright side, I will continue to work with all of the people who helped me in the process, from the marketing and communications folks who helped me craft the messages (and help me comply with Rush’s graphic standards, including the pesky capitalization rules), to the designers who made the words look nice and read well, to the Medical Engineering Center staff (including Bob Lach, pictured here) who helped get them up where they needed to go. 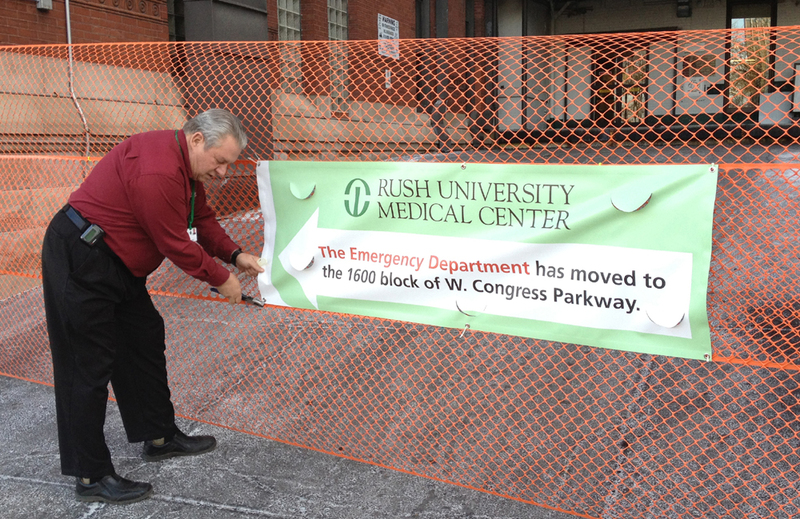 So, even though the Emergency Department has moved to the 1600 block of West Congress Parkway and the Tower is opening on Monday, some things remain the same. And that is indeed a good thing. It is definitely a mix of emotions — new and exciting and yet nostalgic. Cindee, your post is very touching!